Color: Color selected to include a range of medium brown tones and exclude very dark and light pieces from being included. 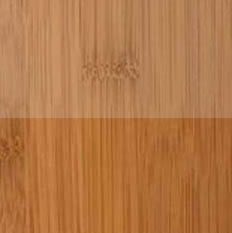 Grain: Horizontal grain bamboo flooring has distinct knuckles formed by the joints in the bamboo stock. Vertical grain bamboo flooring has a clean linear look. Variations Within Species And Grades: Distinctive grain pattern shows nodes from bamboo stalks. Hardness/Janka: 1350; 7% harder than Northern red oak. Dimensional Stability: Above average (change coefficient .00144; 2.5 times more stable than red oak flooring.